My husband, who is wonderful in so many ways, has a serious flaw. He does not like marshmallows. Aside from the obvious concerns this raises about his character, it also means that marshmallows are rarely found around our house. On the opposite end of the spectrum from my husband, I can’t resist marshmallows. If put in the same room as a bag of mallows, I lose all self-control. A desire for one or two puffs as a sweet snack results in a sugary crime scene in a disgustingly short period of time. If you walked in during an episode, you’d find an empty bag and me, out of my mind in a spiked blood sugar haze, with sticky fingers and a terrible stomach-ache. It’s not a pretty sight and without a partner in crime to help share the burden of eating marshmallows, I’ve found it best to just keep our house free of them. But this weekend is the 4th of July. We’ll definitely be grilling, we’ll need dessert, and I just happened to bake a a big batch of these ridiculously good graham crackers. It’s written in the stars. 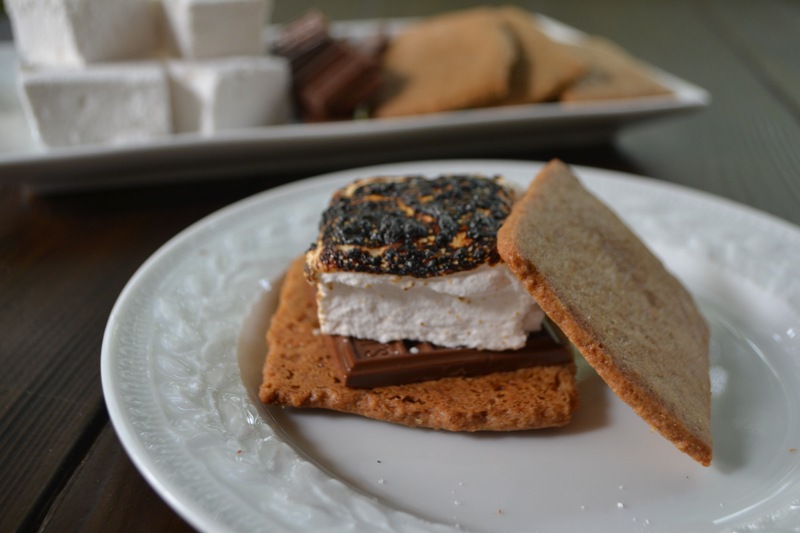 We have to eat s’mores, right? 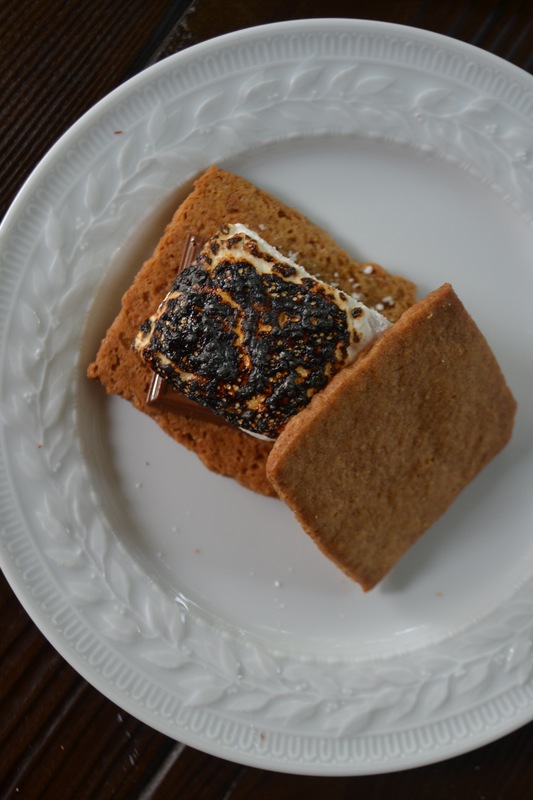 With homemade graham crackers in my pantry, it seemed a shame to use store-bought marshmallows. So this morning I made my own batch of fluffy, tender marshmallows and with the 4th of July still three days away, I’m hoping (as I type this with a mouthful of marshmallow) that I won’t need to make another batch. Happy Independence Day! Marshmallow recipes fall into two different camps when it comes to egg whites. Some recipes omit egg whites completely, while others use anywhere from 2 to 4 egg whites. The reason? Those that do use egg whites claim their marshmallows are more airy and I have to agree that while I’ve omitted egg whites in the past, this batch with two egg whites made decidedly better mallows. Grease a large casserole dish with the vegetable oil and then sprinkle with confectioner’s sugar to coat. Place ½ cup cold water in a small bowl. Sprinkle the gelatin over the water and allow it to bloom. Do not stir. In a small saucepan, combine the sugar, corn syrup, salt and remaining ½ cup water. Heat over medium-high heat; stir until the sugar dissolves. After the sugar dissolves, stop stirring. Boil the mixture it reaches the soft ball stage or 240 degrees on a candy thermometer. Place the egg whites in the bowl of an electric mixer fitted with a whisk attachment and beat on medium speed until frothy. 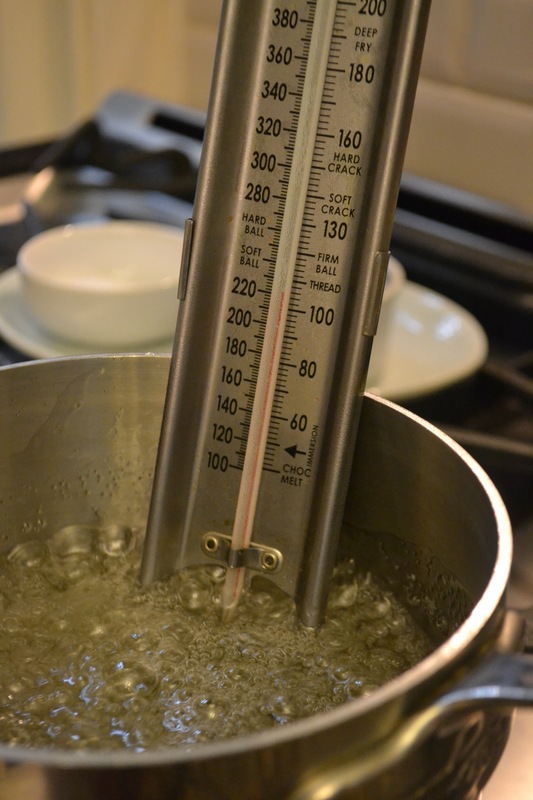 When sugar mixture reaches a temperature of 230 degrees on the candy thermometer, increase the speed to medium-high and beat until stiff peaks form. When sugar mixture reaches 240 degrees, adjust the mixer speed to low. Carefully add the hot sugar mixture to the stiff egg whites. Do your best to dribble the sugar mixture down the side of the mixing bowl into the egg mixture. When all the sugar mixture has been added, increase the mixer speed to high. While you beat the eggs and sugar, scrape the bloomed gelatin into your still warm saucepan (there is no need to wash it after the sugar mixture). Whisk until the gelatin returns to liquid form (place over medium-low heat) if needed. Carefully pour the liquid gelatin into the mixing bowl with the rest of the ingredients and then add the vanilla extract. You may want to turn down the mixer speed when adding the gelatin and vanilla. Continue to beat the mixture for a total of 8 to 10 minutes or until marshmallow mixture has cooled. The mixture will be white and very thick although still spreadable. Pour the cooled marshmallow mixture into the prepared casserole dish and smooth the surface. Sprinkle with additional confectioner’s sugar. Let sit for at least four hours for the gelatin to set. When ready to shape the marshmallows, combine the confectioners sugar and cornstarch in a small bowl and whisk to combine. Slide a sharp knife around the edge of the pan to loosen the marshmallows and turn them out onto a cutting board dusted with confectioner’s sugar. You may have to use your fingers to pull the marshmallows out of the casserole dish, but it should stay in one large block when you do this. 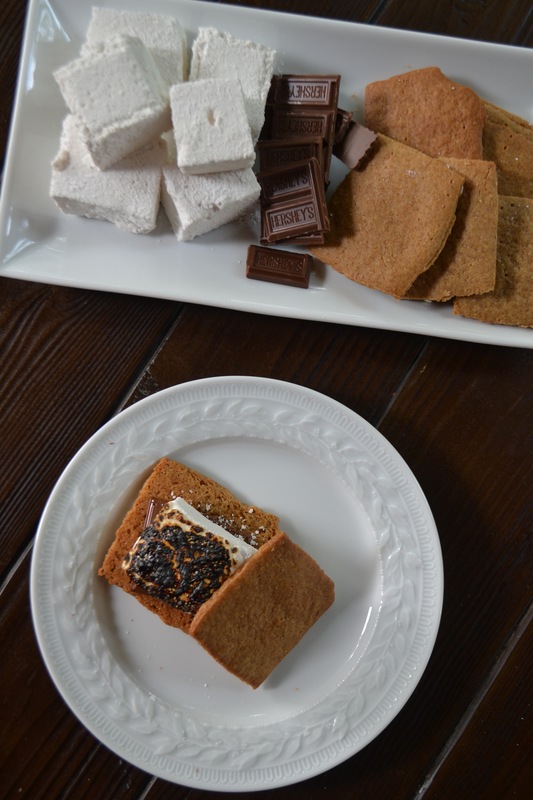 Use a sharp knife or pizza wheel to cut the marshmallow into squares. After cutting, dip each marshmallow in the bowl with the cornstarch and confectioner’s sugar to turn to coat all the edges. Shake to remove any excess cornstarch-confectioner’s sugar and store in an airtight container for up to one week. I have wanted to try making marshmallows for such a long time and I always chicken out! Great post, thanks for sharing.